Whilst the FGM160-II utilises a pair of non-intrusive ultrasonic transducers, provision has always been made to allow for transducer withdrawal from the process under pressure for inspection or maintenance without shut down of the flare. The traditional design to achieve this using a single ball valve, whilst providing adequate isolation, does not offer the increased safety delivered by double block and bleed valves (DB & B). 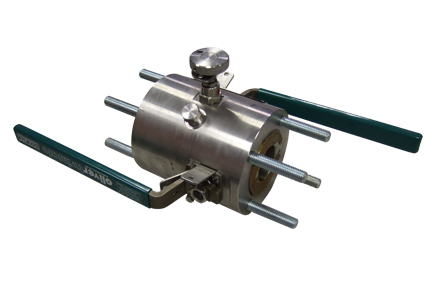 This type of valve achieves both primary and process isolation and the means to safely dispose of unwanted gas and liquid trapped within the assembly. ABLE instruments offer double block and bleed valves with all flare gas meter proposals as an important additional safety feature.